I have several posts written already for this series, but need to put some finishing touches to them. 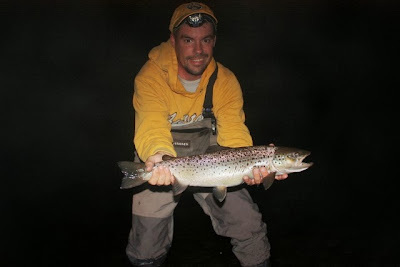 In the meantime here is a great night time pattern by eminent Pere Marquette river guide John Karakashian. He guides for Baldwin Bait and Tackle last I checked. His patterns are simple yet effective, so feel free to check his other patterns out on Youtube also. This is the first mouse pattern I ever tied and I've caught several big fish on it. Give it a try and definitely tie some color and size variations. It's deathly cold here in the North country right now, but nothing will set you right like tying for July. I've decided to so some posts about summer time fishing this winter. One reason is that during summer I'm too busy fishing to write about it. Another reason is that right now it is the nasty cold dead heart of winter so what better way to take us back to our happy place than to contemplate what is definitely a summer activity? 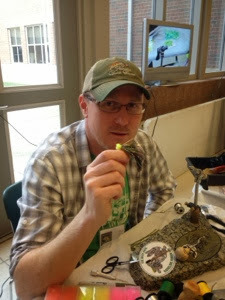 I don't claim to be expert at much in fly fishing, but mousing is one of my few areas of expertise. 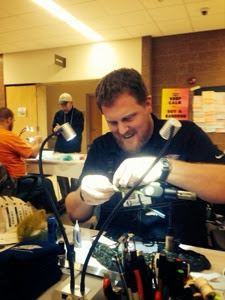 I'll cover the reasons, conditions, techniques, gear and flies you need in order to be successful. Mousing used to be the realm of a few cagey anglers who kept to themselves, but by now that secret is well out of the bag. Still, I'm surprised at the number of anglers who have never tried it. You owe it to yourself to experience this. 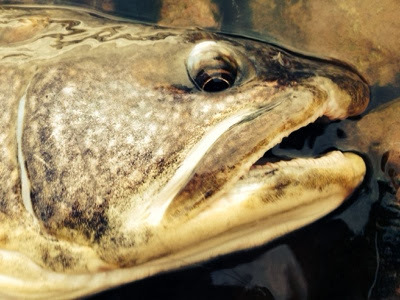 Mousing is one of the most dramatic and explosive takes in fly fishing. You'll be standing there in the dark, every sense on high alert, letting your mouse swing across the current and ba-WHAM, one of the biggest fish in the river will eat your fly. Then it's game on as you try to muscle a big angry fish before it takes you to the wood. Here in the Midwest much is made of the Hex mayfly hatch as a time to catch big brown trout on a dry fly. This is true and it is an amazing thing to experience when the stars align. The problem is that the hatches only last for a couple of weeks in June and they can be spotty. Mis-time it and you can find yourself staring at quiet water. Tie on a mouse and fish that same water and you have a reasonable chance of hitting it big. As a matter of fact I caught three very nice fish this summer swinging mice while waiting for the Hexes to pop. You should have a couple of mice in your Hex box at all times. Mousing can be done from May through September, any time the nights are reasonably warm enough, usually 55 degrees or warmer. 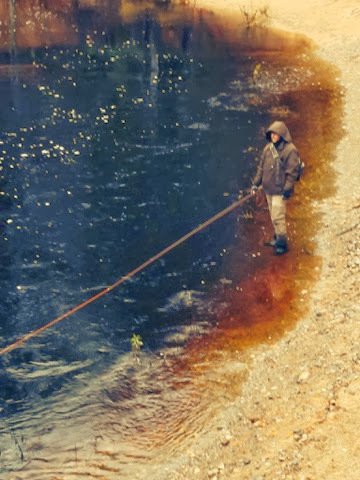 I caught my first big brown mousing during the first week of May several years ago. I rolled a big fish on October third a couple of years ago when it was warm. Instead of waiting on one brief hatch for a chance at big fish, mousing gives you the whole summer. 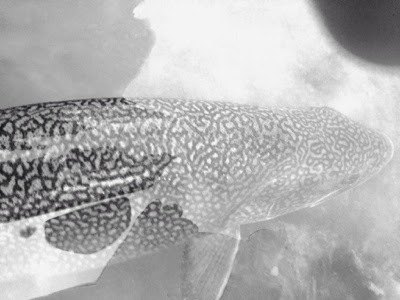 Have you ever wondered if there are any big fish in your river? Mousing is the way to find out. Telemetry studies have shown that once browns reach twenty inches long they become almost completely nocturnal and stay tucked deep under cut banks and log jams during the day. Night is another matter. Big browns come out and roam at will, often traveling several miles in search of a meal. Often times that meal is a mouse or frog that had the audacity to swim the river. 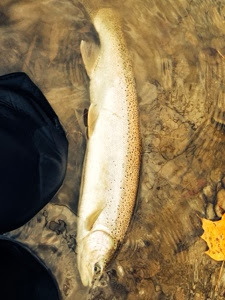 Have you ever wanted to hold a brown trout twenty inches or longer? Mousing is the way to achieve that goal. 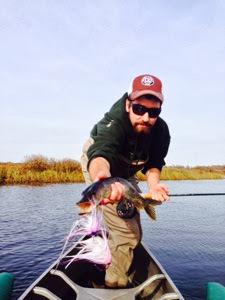 You will catch a handful of smaller fish mousing, but most of my fish are over twenty inches. I've reached the point where I'm not happy unless I've gotten at least one fish over 24 inches each summer. It's very doable, and between me and my fishing buddies we land quite a few fish in that rarefied range. My personal best was over 28 inches long and nearly ten pounds. Mousing does have its challenges and dangers. You'll want to scout the water you're going to fish by day or be very familiar with it already. Going for a swim in the dark is no fun at all and very dangerous. You'll have to buy a LED headlamp with a red LED in it. You'll have to get used to howls, hoots, breaking brush, bats, and beavers slapping the water right in front of you. My mindset when in the woods or fishing at night is that I am the biggest, baddest thing out there, I am a danger to all the critters and not the other way around. This keeps my knee-knocking and wild-eyed staring-into-darkness-at-sounds to a bare minimum. Still, when the coyotes are howling and the owls are hooting a chorus, you smell the wet river smells while staring at the diamond dusting of stars overhead- those will be the most memorable nights of your life. 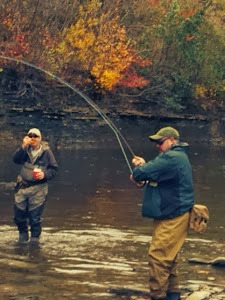 One thing I want to go on record about- mousing is not dry fly fishing. Mouse flies are more like floating streamers, but they are not a true dry fly in my opinion. The take is topwater and usually very loud and explosive, but it is more akin to a bass or pike slamming a frog than a brown sipping dries. This is what makes it so exciting. I'll also add that while this is the best way to learn what kind of fish are in your rivers, they are not pushovers and you will work for them. I have to fish 5-7 nights on average to land a good fish. Sometimes I go out and land a couple big ones in my first hour of fishing, but many times I can fish hard all night and not hook up at all. Mousing is like streamer fishing or sight fishing on flats in that you don't necessarily have to catch fish to have a great day on the water. 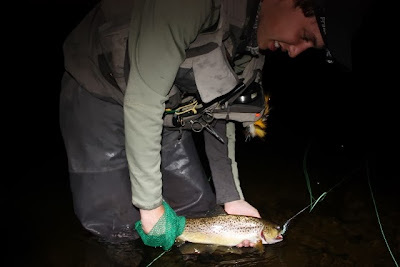 While it lacks the visual appeal of those other kinds of fishing, when you hear a fish strike in the dark that sounds like a bowling ball being thrown in the river I guarantee it will get your heart pounding and your hands shaking. So tune in over the next weeks and cold winter months and I'll walk you through it. I'll cover the gear, water, fish, conditions, rigging, flies and techniques that I've learned. I've spent several summers during which I fished more at night than by day and have caught numerous big fish, and I've learned by trial and error what it takes to be successful. Ya- awn. Stre-Etch. Scrrr. Hey, what's going on? MMC two weeks in a row? I don't believe that. Neither do you apparently, so let's have some coffee. Okay, so last week went off without a hitch. I did MMC, pimped myself in a mag and gave away some stickers. What's not to love? Thanks for all your response to my sticker giveaway. My writing hand has new muscles. I had to go on an IV drip to keep licking envelopes. The bad news is I'm out of color stickers already. My apologies to those of you getting the black and white version. 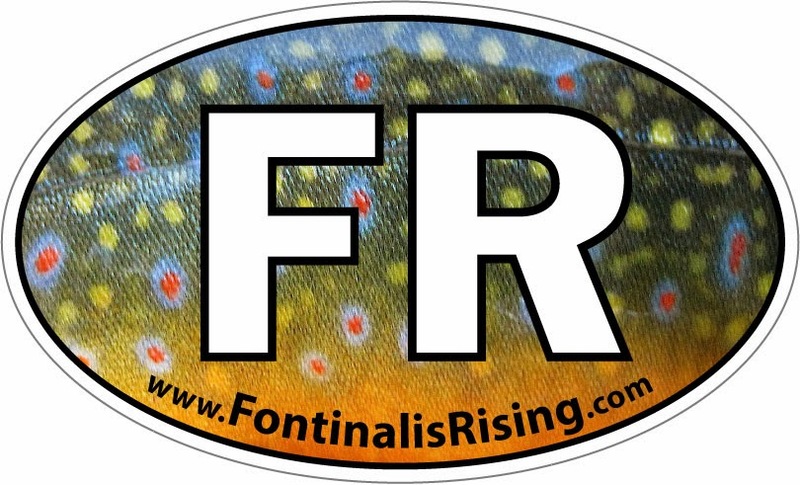 They're not bad looking, they're just not vibrant brook trout print. The first batch of 70 stickers went out in the mail today and I'll keep sending them to whoever wants them. I mailed stickers to half the states in the Union and even to New Zealand. 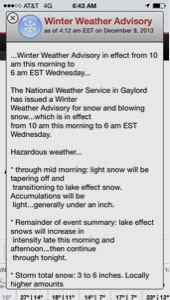 This winter has started out way too serious way too quickly. 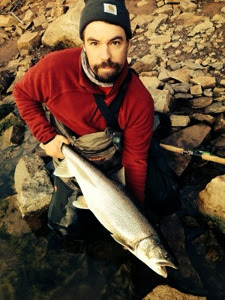 To ward off its pernicious influence I am working on a series of posts on summer fishing. 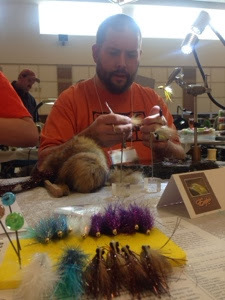 I have already written several posts about mousing, so look for the first installment later this week. I realize I am late getting MMC up, but I put my back out this weekend and have spent my day in agony. That's my story anyway. I'm going to put the finishing touches on my first mousing post so I'll cut this short. This summer I ordered several hundred stickers to rep my blog. Then I did nothing with them. They are doing me no good. I'm giving them all away. Okay, so I had my local print shop print up a few hundred black and white oval stickers. 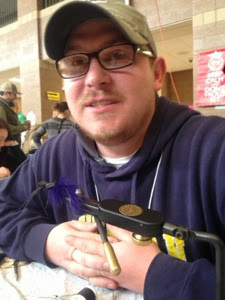 Then I got a hold of Matt Zudweg of Boneyard Fly Gear. 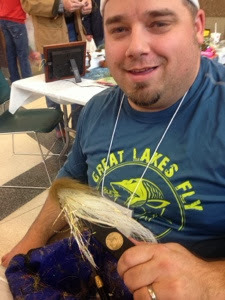 Matt is a fantastic southwest Michigan guide and fly tyer, but he has a background in graphic design. 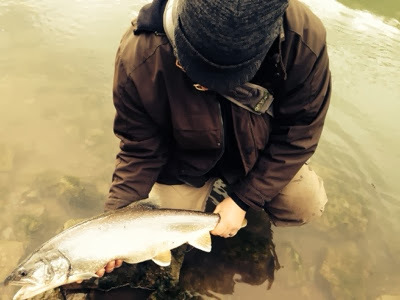 This is a fish caught recently by one of his clients on the fly he is holding above. 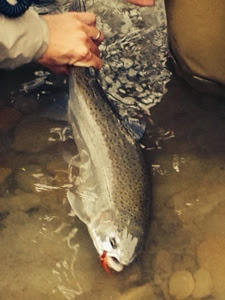 It is an 18 pound steelhead. Matt came up with the following design. I've handed out a few stickers to close friends, but have sat on the rest. Now I know a lot of bloggers and shops etc. sell these things for a few bucks, but I can guarantee you that no one is making a mint off them. Since their real purpose is to promote my blog I'm going to give what I have away. So here's the rules: Enter your information in the form. I'll send you a sticker. I have 60-70 full color stickers left, after that I'll be handing out the black and white ones. First come, first served, and the giveaway ends Dec. 31. Out of all the e-zines out there This Is Fly has been my favorite for some time. 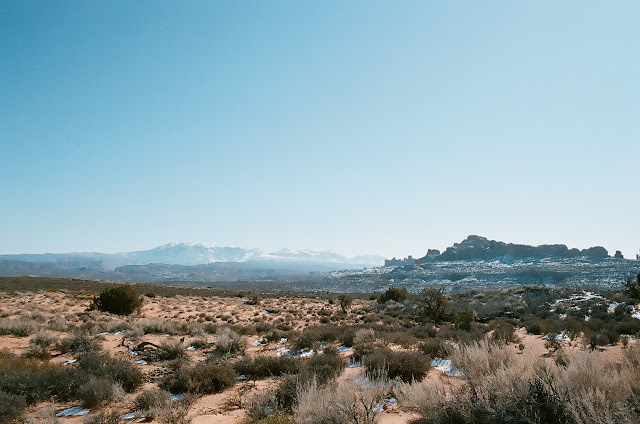 Between the quality of the writing, the stories told, the photography and the soundtrack it all adds up to a completely engaging sensory experience. So imagine my delight and surprise to see my name in its digital pages as part of the cover story. Okay, so I didn't write this one. Dave Karczynski did. 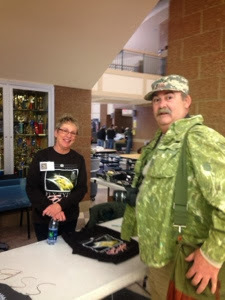 It is a very entertaining and highly fictionalized version of our fall muskie trip. Share and enjoy. "That secret is this: the fly at the end of your line is not a fly, it is a character, it is a marionette. Thus it follows that your retrieve is not a retrieve, it is a story. As the auteur knows, before you can tell your story you must know your character." Oh, and I'm Trutta in this parable/through-the-looking-glass tale. Yaaauuuuggghhppphhhttt!! Yawn, stretch, scratch, repeat. It's Monday once again, it's cold out and I have to dash out the door in a few minutes to run off to that nightmarish hell I call work. So let's have some coffee. "What the what?" you say? "Is Monday Morning Coffee back?" The answer is yes. For, you see, I wrote a novel last month, and now I know I have no excuse. 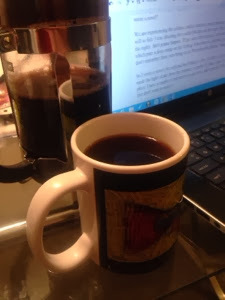 The novel is over 51,000 words, which is about as many as you can find in this entire blog. Give or take. Please bear with me over the next couple of months, I'm going to be a complete pain in the rear. At every occasion possible I'm going to casually say "Well you know, I wrote a novel in November." I'll get over it eventually. The conversations will go something like this. You: "I hear there's another snow storm coming." Me: "Well in November when I was writing my novel. . ."
You: "My mother is extremely ill. The doctor says she doesn't have long." Me: "Does she like to read? I'll send her a manuscript of the novel I wrote in November." You: "Mr. Tucker, what do you do for a living?" Me: "I'm a novelist, officer." The upside is that now I have a book to pimp. The downside is that now I know how lazy I have been. If I can crank out that kind of volume in a month, there's no reason for me not to do MMC each week plus a couple of blog posts per week, work on some magazine articles and finish my FR book. The reptilian part of my brain just remembered that this is a fly fishing blog, and I'm sure you're wondering what is happening on the fishing front. The answer is nothing. Nada. Jack squat. 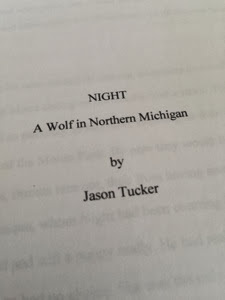 Did I mention I wrote a novel? We are experiencing the coldest, earliest winter in recent memory and it has completely crushed my will to fish. I was shooting for a solid 100 days on the water this year (check the Jealousy Counter to the right). Ain't gonna happen. I'll get out a little more yet, but we're having 20 degree days this week, which puts a deep crimp on the fishing. 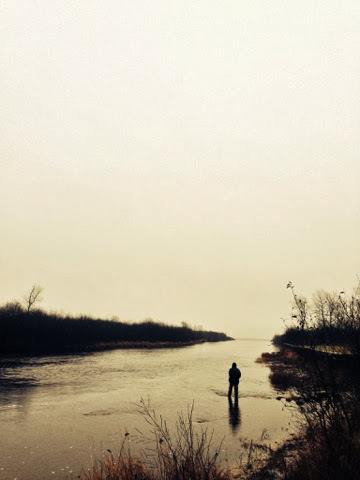 It has been so cold that I saw guys ice fishing in November. I don't remember there ever being fishable ice in November here before. 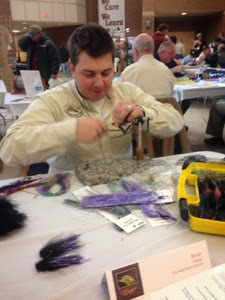 I might ice fish this year, or maybe just tie flies. 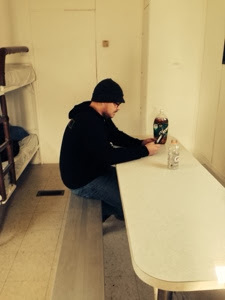 So I wrote a novel, it's cold and the fishing is slow. I do have a lot of stories and photos that never made the light of day from the summer, so maybe if I share some of those it will take us to our happy place. I have a couple of rod reviews to get done, and eventually I'll have to bundle up and go fishing. I just don't want to rush it. I'm designing a bigger better tying desk for my living room and hope to start building that after the first of the year. 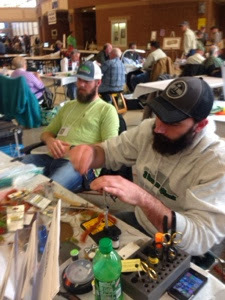 Saturday I traveled with Alex Cerveniak to the Great Lakes Council Federation of Fly Fishers Fly Tying Expo Invitational 2013 down in Holt Michigan. It was a good time. I got to meet some folks and see a lot of you, my friends. I appreciate all your support and encouragement. I enjoyed seeing your creations. My only beef is that the name of the show is a bit clunky. My fingers cramped typing it. We need to rename it, something snappy, something that sings. Snapfly or Tie-o-Rama, you know, something original. The current name sounds like the place fly tyers go to be judged and sentenced. 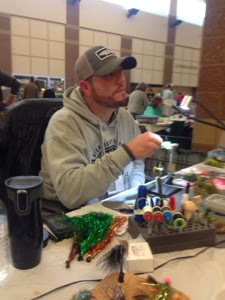 One of my favorite people at the show is Matt Zudweg. 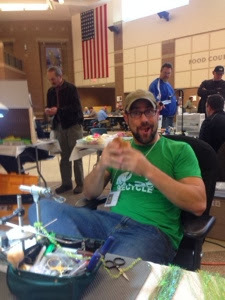 He's a Michigan guide and tyer and all around good guy. This summer he designed some very cool brook trout print FR stickers and I've given out something like six of them. Some time this month I'm going to give them all away, so stay tuned. Well, I can hear the wind whipping up out there on the tundra and it's time to dig out my car. Have a great week in whatever tropical paradise you happen to live in while you're fishing for rooster fish or peacock bass or whatever it is you fish for. 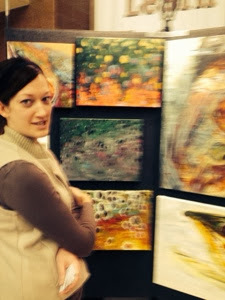 Here's some pics from the show. Okay, so I was inspired by a blog post by Deneki. They set the bar pretty high. Here are their 50 things. 2. 5 AM after fishing all night. 3. The whisper of wings smaller than a postage stamp. 6. That smell. I don't quite know what it is. A combination of DEET, smoke, watercress, deer hair, sweat, electrical tape, reel oil and cork. My grandfather epitomized that scent. 15. Tommy F. Lynch. Long live the donkey king. 16. Phil Croff's magnificent cedar drift boats. 18. 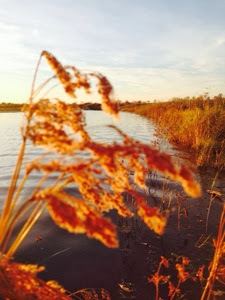 That grass that grows on the water's edge. 20. Carp. Long may he endure upon the earth. 23. The way Alex Cerveniak abuses his car, as if the sooner he beats it to death the sooner he will be admitted to Valhalla. 26. Dirty fries in downtown Traverse City. 27. Dirty sheepshead in downtown Traverse City. 28. Tag alders. Wait, did I really say that? 29. Broken line, lost flies and good stories. 30. Leaky waders. No one cares about the trips in which you were happy and comfortable. But spring one leak in those Simms? Priceless. 31. Owls. What a hoot. 32. Coyotes. My night is not complete without them. 33. 333 line. I can cast that like no other. 34. My TFO switch conversion kit, which turned my already awesome 8 weight into a spey beast. 36. Wolves howling in our camp this last fall, while we were in search of water wolves. 37. The gentle feel of my rod loading. 38. That moment that I realize a cast is failing. 41. All those people I haven't met yet who are fully engaged with this sport. 42. Those little ice cupolas that form on the ends of branches that trail in the water. 43. Steelhead. In all their forms, and wherever they live. 44. The mess that is my tying desk. 45. 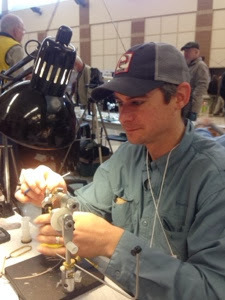 The great masters who have set the bar in fly tying. 48. Bait fishermen. Without them what would we compare this to? 49. Aluminum canoes, plastic kayaks and any other means of conveyance. It was the 2013 Rustbelt Drake Bake (invitation only). 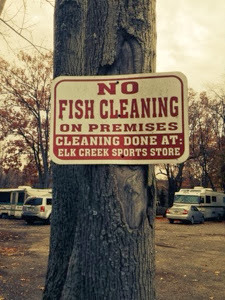 Being that it was held at Elk Creek Campground we opted to fish right there on Saturday. 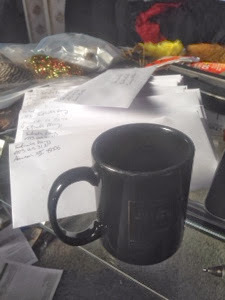 I awoke to a less than perfect world Saturday, but after a couple cups of strong coffee and a peanut butter, jelly and smoked provolone sandwich I wadered up and took a peek over the bank. Two guys were hooked up on fish. I wandered down to the access and a herd of anglers stood at The Wall elbow to elbow like soldiers in their jack-booted waders fishing in lock-step. 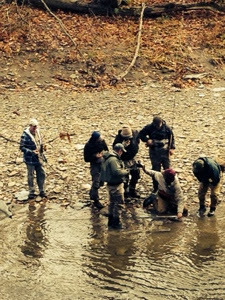 The guy on the end was fighting a good steelhead. 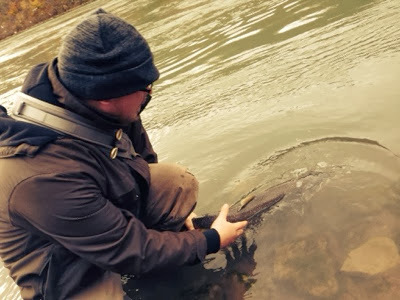 The running joke is that the proper way to release a fish is to kick it out onto the bank, stand on it to remove your hook, then kick it in the head back into the river. This is industrial fishing at its finest. 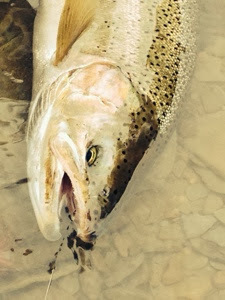 The Lake Erie states crank out millions of steelhead smolts which are not so much fish as say hot dogs or Twinkies, mass produced, quality controlled, pre-packaged and then sold at a profit. "Come to Steelhead Alley and catch a steelhead" say the brochures. The average working stiff here is going to be pissed off if he drives an hour and a half from Pittsburgh or wherever the hell be came from if he doesn't catch a fish. He paid for it after all. It was tough to find a spot in the herd to wedge myself into so I decided to do what I do at home when the going gets tough and pick the river apart, finding the micro spots that just might hold a fish. I found a small run with a deeper seam and no one fishing it. I set up at the top intending to work through it but some old dude came and parked right at the prime spot below me in the center of the run where the water starts to slow. Then some other guy flanked me on the right. I did the only thing I could think of and low-holed Old Dude. I was probably the jerk here. It was probably Old Dude's name carved into the tree on the bank. I wandered back up past The Wall (two people hooked up), past the next prime lie (likewise two people hooked up) and fished the crud above that. Our crew included a large contingent of gang-banger Spey casters who managed to wedge themselves into the prime run below the tubes. 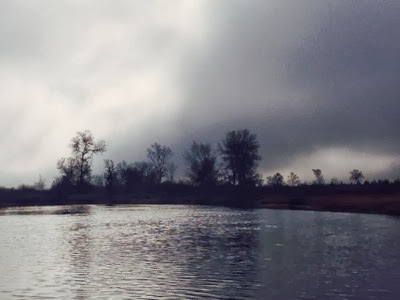 It was a combat fishing maneuver, artfully done, beautiful in execution, until they had carved out enough real estate to accommodate a half dozen Spey casters and they just kept rotating through. It was mesmerizing to watch these guys punch out cast after effortless cast. Guys like Rick Harrington or Nick Pionessa make it look easy but I'm not fooled. I had wanted to put on my Skagit head and cast a little, but I'd rather thrash around in private. This is foolish vanity on my part as I probably could have gotten a free lesson out of Rick. About halfway through the afternoon I was fishing the No Man's Water in between the Spey gang and Bait Platoon Bravo when my indicator dipped under and I was into a four pound hen. I landed her quietly, removed the hook without taking her out of the water, snapped two photos and let her swim away. I hooked up three more times including a much larger fish that rooster tailed my line before coming unpinned. The Spey guys seemed to hook up a couple of times an hour and every fish was greeted by a gang of guys with cameras snapping. They were a good bunch, and I've never fished with so many truly good anglers at the same time. It was like attending a beat poetry jam in which everyone got a turn at the mic, each had his own style, each giving a fascinating performance. I was in my bunk sleeping before 9 and slept like a stone. I awoke at first light to a howling gale and went to the cook shack in search of coffee. Alex rolled out shortly after and we went to look at the river. If anything there was already more guys jostling in the river than yesterday. I'm not complaining, it's not any different than what you'd see at Tippy on any given weekend. But there's a reason I don't fish Tippy. Alex and I looked at each other and got into the car. We're driving home now and we're not disappointed. We have achieved our goal. 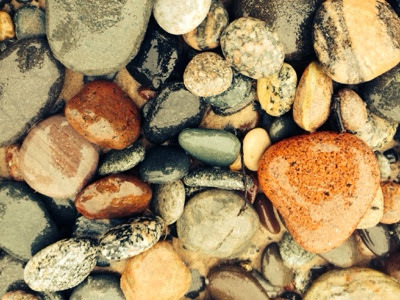 5 days, 5 rivers, 5 Great Lakes. The Niagara River does not flow so much as boil. It is an immense river , a seething cauldron of angry green water. It flows through a limestone canyon and the water next to shore is 180 feet deep. Fishing it is a powerful experience. 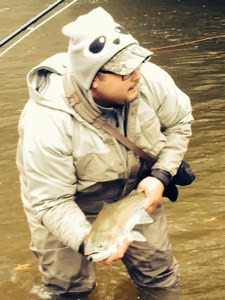 Word at the fly shop was that the steelhead were there but that it was slammed with lakers. Alex continued to swing and I chose to indie fish. The fish were feeding on emerald shiners killed when they went through the dam. Every couple of minutes a giant fish explodes on the surface taking dead and crippled bait as they float by. We both caught our first lakers on the fly. It was pretty cool. I never saw the first fish I hooked up on. It turned and ran downstream taking my fly line and half the backing. I chased it quite a distance until my line went limp. The broken line was badly frayed. There was a steep learning curve to this water. One moment the water in front of you can be calm as a farm pond, the next it will become a raging eddy flowing upstream. I had my float change directions 4 times in a single cast. It kept me mending constantly. We had a good time. We caught several more fish. I lost a bunch when they would dive down the steep walls of the canyon, raking my line across the sharp rocks. My switch rod was magic for mending and reaching out past the drop off. 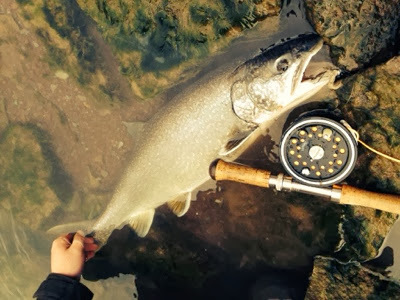 Our Lake Ontario trib is now in the bag. It felt oddly familar to be there. Then I realized I was fishing all of my home waters at the same time. I still haven't resolved the formatting issues as a result if using the Blogger app. If this post looks funny on your computer try reading it on your smart phone or other mobile device. Another day another 5 hours of sleep. I'm going to have to go home just to get some rest. I met artist Richard C. Harrington last night and we talked at length. He talks like a soul-surfer except everything he says makes complete sense. I think I found a guru. He's invited me to his compound as long as I give him my fly rods, you know, for the Foundation. He reminds me of Obi-wan Kenobe only more enigmatic. 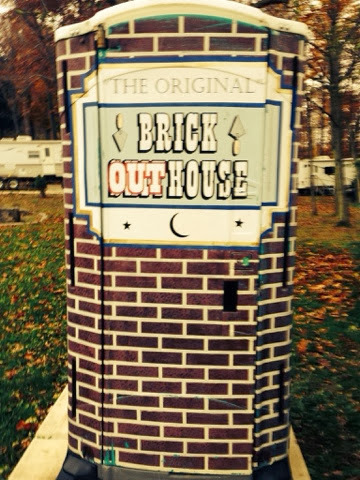 We stayed at some campground in PA that had been overrun by guys who are on The Drake forum and everyone introduced themselves by their forum handle which means I felt pretty out of place since I'm not on the forum. I met Chrome1, HamrHed, Mouthbrthr, and MlyLuvr whatever that means. In person they were guys from New York and North Carolina, Pennsylvania and West Virginia. I don't think there was a bad guy in the bunch. I also met Dave Hosler of the Pile Cast blog and Matt Dunn of Fishbeer so the blogger community was well represented. We're off to fish the Niagara River since all the other rivers are blown to hell and gone. Hopefully today will bring some fish. Tonight I'm going to get some sleep if it's the last thing I do. I'm still trying to figure out the blogger app and I'm finding it formats posts for mobile devices but in the web version the pics are too big. If you are able use a phone or other mobile device to read this. The FR IT department has been fired. The concept was all Alex Cerveniak's. We were supposed to head down to Steelhead Alley and meet up with some friends there and fish for lake run browns and steelhead. We decided to take it a step further. 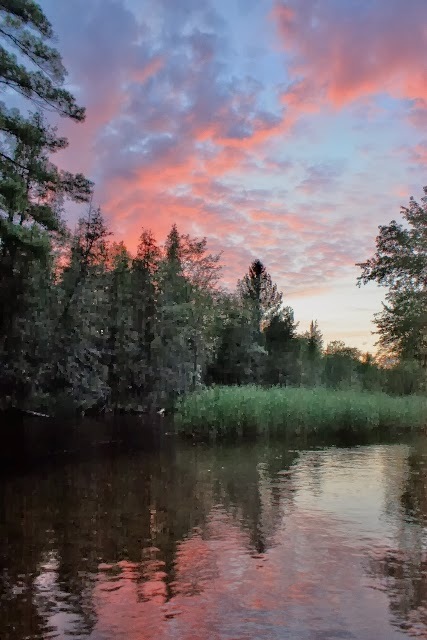 We are going to fish at least one tributary connecting to each of the five Great Lakes, starting in Michigan's UP and working our way south. We're driving to PA as I write this, the music is thumping and I've just discovered the tech miracle called the Blogger app. 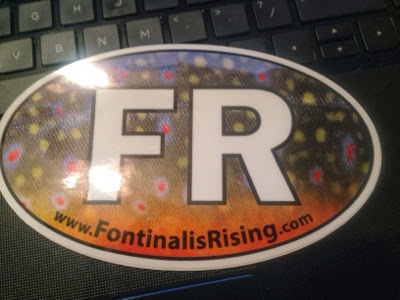 Fontinalis Rising will never be the same. 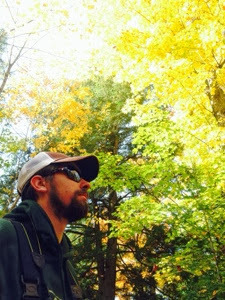 We started yesterday, hitting the Carp River (Lake Huron) and then The Two-Hearted (Lake Superior). It has been raining almost continuously for three weeks so all the water is high and stained. All of the tribs have fish now so it's a matter of picking your poison. 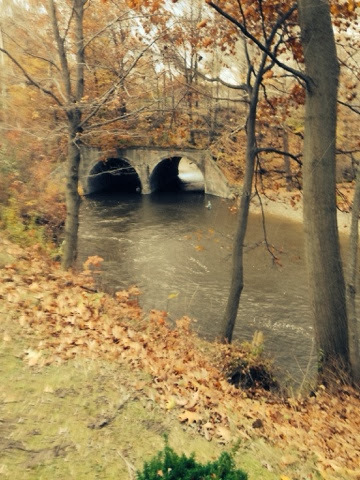 We gave the Carp river a token effort before heading north. We followed Alex' map app and I'm surprised we didn't drive into a lake somewhere. We ended up driving over 50 miles down roads the consistency of oatmeal. When we got down to the mouth the wind was blowing a steady forty miles an hour with monstrous waves crashing on the beach. 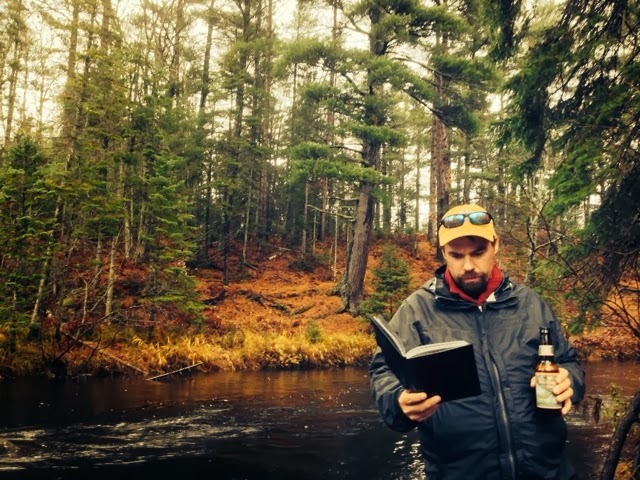 Standing on the Two Hearted River, drinking a Two Hearted ale while reading Hemingway's The Big Two-Hearted River. Angels sang. We retreated from there to the more sheltered area of Reed&Green bridge. It was fishable but high and the color of strong coffee. Alex is on a mission to catch a fish on the swing. My mission is just to catch a fish. Alex is pumped because he actually got a coho to eat. It was good enough to release itself before Alex got salmon stank on his hands. Cohos were rolling everywhere, but with such dark water it was tough sledding. Thanks to some foresight and a crock pot we came home to a hot meal. 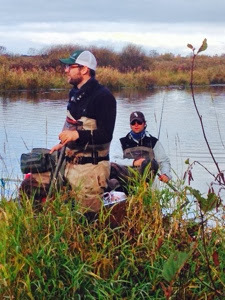 Then we bugged out to hang out and tie flies with Zach Ginop and Tom Menas near Boyne City. Which brings me to today. 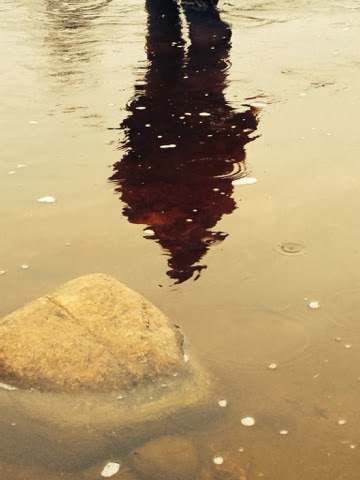 After more than an inch of rain every river in the state is blown so we decided to go hit the tailwater section of the Boardman (Lake Michigan). Tom of course caught three browns indie fishing before we even got rigged up. I just bought a switch kit for my TFO rod, which is blowing my mind just a little. It is a beast master now. I bought it to help my indie game, but Alex sold me a Skagit head cheap out of the back of his van and Tom gave me an impromptu casting lesson. Now there's a new siren song calling me to a different set of rocks. So we are en route to PA , the music is thumping and we're armed and dangerous. We're going to go see if Erie PA is big enough for the both of us.